In most states, if you want to renew your license or become a newly licensed auto dealer, you are legally required to file an Auto Dealer Surety Bond. Also called a Motor Vehicle Dealer Bond, your state’s Department of Motor Vehicles (DMV) is generally the “obligee” or the party requiring the bond. 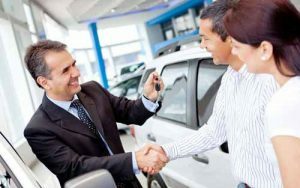 An Auto Dealer Surety Bond means that a surety specialist (such as SuretyGroup.com) reviews your dealership’s financial and character qualifications. After the review, they may certify your dealership for bonding. Why would you want an Auto Dealer Bond? This type of surety bond offers you more than just compliance with government rules. A Dealer Bond can be a competitive advantage. It shows that your dealership is financially viable and committed to ethical business practices. Think of your Auto Dealer Bond as a guarantee that you offer your customers – an assurance to them that you have taken steps to protect them against fraud. If a transaction does involve fraud or other actions that harm a consumer, the bonding surety company will seek to positively resolve the situation. This is another beneficial reason for customers to work with you. In turn, this may help you attract new and repeat customers – a WIN-WIN for everyone! How do you secure your Auto Dealer Surety Bond? Will the process be confusing or daunting? Absolutely not. SuretyGroup.com is here to help you each step of the way, assisting to secure your bond as quickly and easily as possible. You start by submitting your Auto Dealer Bond application. During this process, we will ask you to provide financial information and submit to a credit check. As a surety company, we must do this to ensure you are responsible and trustworthy, able to pay your debts on time, and are a sound dealership qualified for bonding. But what if your credit score isn’t golden – will we deny your surety bond? Not necessarily. It may make securing your bond more difficult, but SuretyGroup.com has special programs to help applicants with low credit scores. We’ll be happy to assist you in this way. SuretyGroup.com has been underwriting surety bonds throughout the U.S. for more than 35 years – and we write more Auto Dealer bonds than any other type of bond. When you work with us, you will have confidence in our team of highly experienced surety professionals with in-house underwriting authority. This allows you to receive low rates, quick approvals, and fast bond delivery; in most cases, we send your bond within 24 hours after application submission. If you have any questions, please call our surety professionals today at 1‑844‑432‑6637 or email info@suretygroup.com. SuretyGroup.com – Your Online Bond Provider. Great Rates. Solid Advice. Quick Solutions.